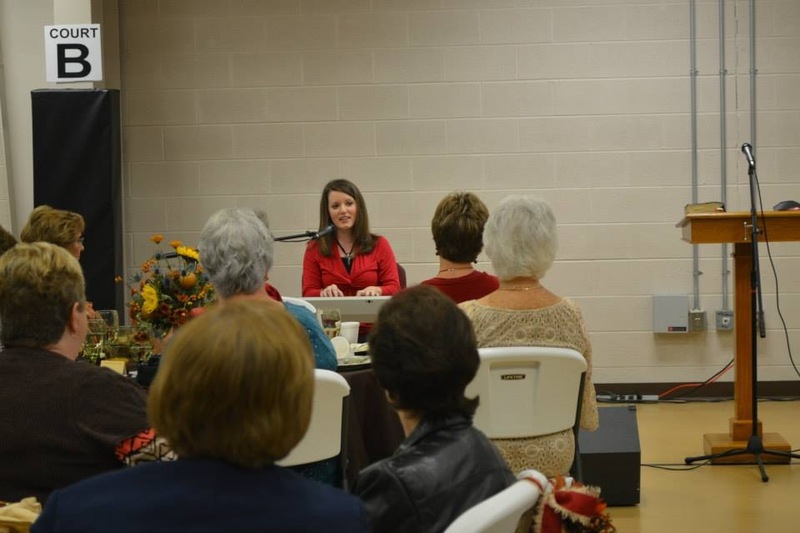 In February, I asked God to send me an opportunity during my church’s monthly Women On Mission meeting. He has faithfully opened my eyes to every day opportunities since then, and has also sent some special opportunities my way! 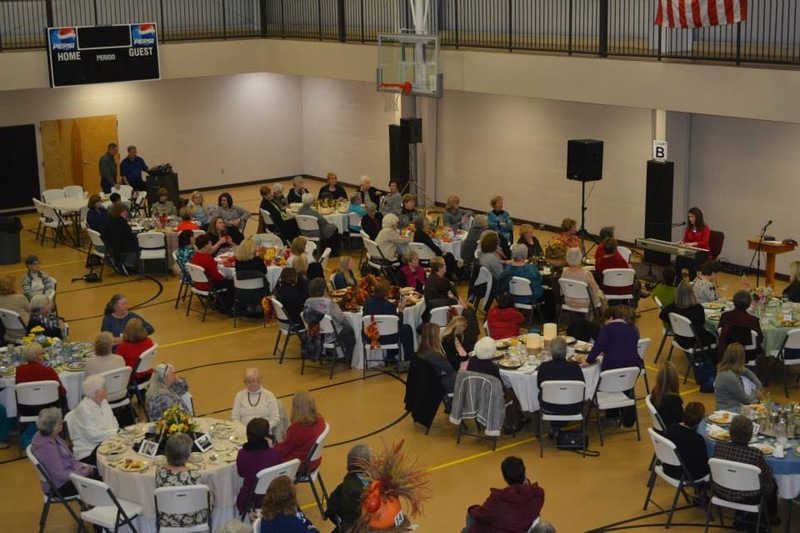 This past weekend, I got to participate in a wonderful fundraising event for Anchor Ministries, the Cleveland, Alabama site for Christian Women’s Job Corps, an auxiliary of the Women’s Missionary Union (WMU). I felt like my prayer had come to fruition in a neat circle. I had prayed for God to send me an opportunity at a WMU meeting, and here I was at a wonderful event that is affiliated with WMU. Of course while the prayer had circled around, I don’t think the journey of opportunities is over. I think the circles will get bigger and bigger! Sharing and singing with wonderful ladies. Anchor Ministries is a faith-based program that offers combined practical training, relationship building, spiritual growth, and emotional healing for women. They provide this in a classroom setting and in one-on-one mentoring. Anchor Ministries works with women who want a better life, self-confidence, self-respect, self-sufficiency, and hope for their future. While Anchor Ministries is based in Cleveland, Alabama, there are other Christian Women’s Job Corps sites. You can find a site near you at http://www.alawoman.com/cwjc. There were several moments and testimonies that especially touched my heart at the event this weekend. We heard from Charlotte Stevens, the Site Coordinator for Anchor Ministries, who spoke about asking God where He wanted to use her in her walk with Him. 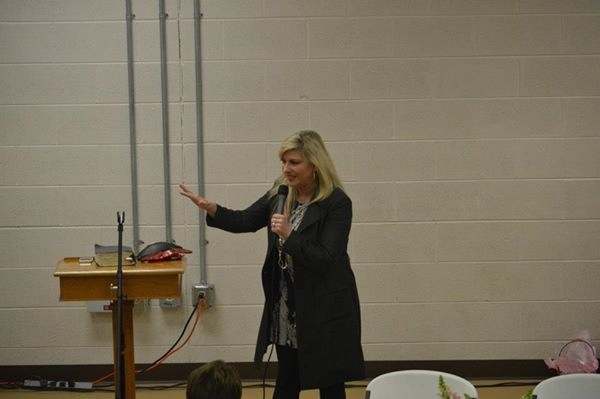 She shared how the Lord led her to serve with Anchor Ministries, and her love for the women who go through the program is so evident. Charlotte has definitely embraced what it means to be the hands and feet of Jesus in a hurting world. We heard from an instructor, a mentor, and a participant in the program, all of whose lives have been changed by a God whose plans are bigger than ours. The circumstances in our lives often surprise us, but they are never a surprise to Him. We heard from Brenda Ladun, our wonderful keynote speaker. Brenda is a local news celebrity who has encouraged so many with her story of how God is bigger than the breast cancer that visited her not once, but twice. But her words were about so much more than her journey with cancer. She reminded us of God’s love for us, and how He shows us His love through His word, through His creation, and through other believers’ encouragement. Brenda Ladun, a local news anchor. A survivor, writer, and encourager. After hearing from all of these women, I began to see a common thread in the testimonies. So often as Christians, we get caught up in “busy work”. As a teacher, I think of busy work as being a worksheet or an activity that doesn’t produce anything new. No new learning, no lasting significance, just something to keep students hands busy, but not necessarily their minds. I have definitely been involved in my share of “busy work” as a Christian. I’ve gotten my hands into activities and projects that look good on the outside, but they don’t necessarily produce lasting effects for the kingdom of God. I’ve even had periods of time in my walk with Christ when I’ve completed tasks just so I could check them off of my busy list. I’ve had no new learning, no impact on my own heart or the hearts of others. A wonderful instructor for Anchor Ministries said some words that really pierced my soul. She spoke about how we so often become busy serving in our churches that we don’t leave room to go out and serve outside of the church. We forget that God called us to take His love to a lost world, to those who are hurting and searching for hope in the middle of life’s storm. And that’s what Anchor Ministries is all about. 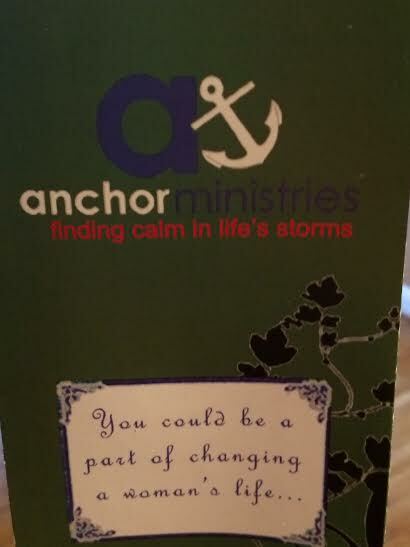 Helping women to find calm in life’s storms. When I think of the women who are served through organizations like Anchor Ministries, I’m reminded that although we all have different events in our stories, filled with different chapters and paragraphs, with commas where others have periods and exclamation points where others have question marks, our underlying themes are the same if we are children of God. My testimony is a story of grace and glory. I was raised by parents who brought me to church every time the doors were opened. They brought me up and told me of a God who loved me and cherished me. I had a sheltered childhood. My parents protected me from concepts that were too mature for me and people that were bad for me. When I was a young girl, I gave my heart to Jesus. I fully believe that He came into my heart when I asked Him to as a young girl and that He has stayed there, teaching me and guiding me ever since. That’s pretty glorious. But guess what? I’m a sinner. I’ve made some choices that I definitely regret. My heart can be pretty selfish and black at times, and I desperately need His redemption daily. There are women—and men—who have had a much different childhood than mine. There are people who have made choices that they wish they could change. There are people who find themselves in circumstances that may not even be of their own making. They may be caught in the middle of life’s storms, looking for an anchor. Is that you, friend? Because if it is, your story can be one of grace and glory, too. God can gloriously pull you up from wherever you are. He can change your circumstances if it’s His will. Or He will change you. If you think that your past is too clouded with mistakes, He will cover it with his grace and redemption. That’s pretty glorious. Take it from me, a girl who has received His grace over and over again. What I was reminded of this weekend was that no matter where we are in this life, whether we are a director of a wonderful program like Anchor Ministries, or a news anchor with an encouraging word to tell; whether we are a gifted instructor, a life-changing mentor, or a brave soul ready to make a change for the better, if we are in Christ, we can say that our story is Grace. We can sing the song of Redemption. We have a common bond that makes us the same, and it’s Jesus! A roomful of women who have the story of Grace and the song of Redemption. *Thank you to Lisa Kimberly Hunt for the photos. This entry was posted in Devotionals and tagged Anchor Ministries, Brenda Ladun, Christian Testimonies, God's Love, grace, Jesus, redemption, WMU, Women's Ministries. Bookmark the permalink.